We have identified some checks that you can make to troubleshoot door handles which do not spring back satisfactorily to a horizontal position. Often, fixing drooping door handles can be fairly straightforward, especially if it's one of the issues shown below. Where the door handles are not sprung, typically seen on coloured nylon and commercial stainless steel handles, it is advised to use latches or locks with heavy duty springs. On this type of handle, all the sprung force is provided by the latch. Check whether you are actually using heavy duty latches with these handles and not standard latches on your installation. The vast majority of handles are sprung however, so standard latches are suitable. Try loosening off the fixing screws on the handle back plates or roses. If the handles now work properly, there is most likely a binding or misalignment problem. The mechanism at the back of the handle (where the spindle is inserted) can often slightly protrude from the rear face of the back plate or rose. It is a common fault for the mechanism to bind in this area and by loosening the handles this bind will have been released. There must be sufficient clearance on the door face for this mechanism to rotate and this is normally achieved by having a larger hole on the door face to provide adequate clearance. Simply enlarge or chamfer the hole as necessary and refit the handles. Check that the spindle is not too long and causing a bind or misalignment as the door handle is tightened up. Spindles need to be cut to suit the door thickness, so should not be so short that they can disengage with the handle follower by sliding into one or other of the door handles. This can cause a door handle to become inoperative potentially locking someone in a room. There should however be a small amount of end float in the spindle length to prevent binding and allow for natural movement during operation of the door handle. Check that the spindle is not misaligned with the latch follower. Viewing the spindle from the door edge with the handle loosened, it should be possible to recognise any spindle misalignment. This could be tricky to fix because it is likely that the mounting screw holes for the handles are in the wrong position. It is also likely that they are just slightly out, meaning drilling a new pilot hole right next to an existing one, which doesn’t really work. A way round this is to replace the screws with back to back fixings which will clamp the handles on the door even with elongated holes. If your installation is old and has worked well in the past then it is likely that one of the components have failed. The best way to test this is to dismantle the door handle assembly from the door and check each component individually. Try each handle then check the latch by turning the spindle. A visual inspection of the latch follower may also show that this may have cracked, a fault which can develop due to misalignment of the door handle spindle. If the latch has failed then a like for like replacement is relatively inexpensive and will solve the problem (but try to resolve any misalignment that caused the failure too). There is no standard spring type for all handles; they tend to vary between brands regardless of how similar they look externally. Manufacturers can change the spring design and mechanism in their handles over time depending on their sources at the time of manufacture. Some door handle springs are handed for each handle on either side of the door and sourcing the right one can be confusing. Replacement may not always be straight forward; the circlip can break or weaken leading to premature future failure. The packing washers may not always go back as expected or be worn leading to a stiff or loose action. 7) Check the door latch itself. Many people fit new handles and leave in the original latches and locks which may be old. Remove the handles completely and check the movement by turning the spindle. If the latches are new, remove them to check that the mechanism body is not being squashed or crushed by the mounting hole in the door being too small. If the latch was sticking in the door and works fine when it is removed from the door, this indicates some binding of the mechanism. Ensure that the mechanism has adequate clearance in the door, checking that any external moving parts do not catch on timber when the latch is screwed into place. Check that wood shavings have not entered into the mechanism of the lock or latch. We have witnessed many allegedly faulty locks only to find wood shavings inside the mechanism when we inspect them inside. Do not however open a lock case unless you are skilled in doing this, since many manufacturers will void their warranty where the lock case has been opened. It is advised to return it to your dealer for inspection if you suspect a problem with the lock. 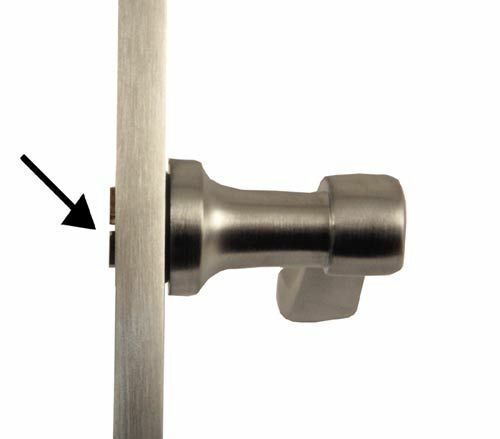 Sometimes door handles can become stiff due to corrosion of the mechanism, particularly on an external handle or perhaps a bathroom handle. Remove the handle and try easing the mechanism with a spray lubricant. Once eased off, wipe everything down and grease the mechanism before replacing to avoid any future problems. Greasing the mechanism on any external handles, or handles exposed to excessive moisture, is a good idea when fitting them from new. A new individual handle when operated in the hand may seem a little reluctant to spring back. This is not necessarily a fault as all the springs in an installation work together and help each other. If you feel one is unduly stiff however, this is usually solved by working the handle off the door in your hand with a little lubricant in the mechanism. This will not likely be a problem, because the handle will free up further with use after installation and the packing washers in the mechanism bed in. 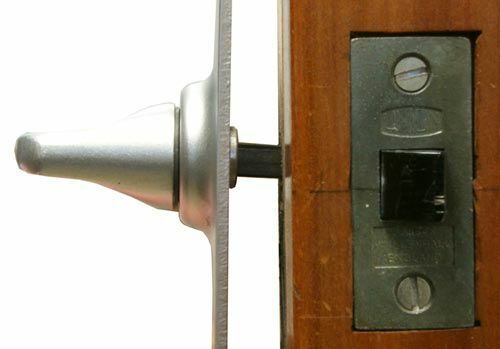 We hope that this article helps solve drooping door handle issues. If all the individual components work properly when held in the hand, and are compatible with each other, it will most likely be a fitting issue that would cause a problem. If your handles are old and the springs have failed then it is probably time to buy replacements and refresh the look in your room. The exception to this would be if your original handles were very expensive or in character with a period style building such as a stately home. Some UK manufacturers such as Frank Allart will refurbish and re-spring their own branded handles. This will not however be without significant cost, but if they are solid bronze or similar then this expense would be reasonable as replacements would be very costly. If, after troubleshooting, you wish to replace your door handles, view our latest collection here and use the filters to home in on your preferred type. Alternatively just click on a style box on our home page and search throught the categories to find your new style. If you need help, contact us for advice today.